Dallas Clayton's An Awesome Book is really awesome. It's funny how a children's book can be more profound in its simple words and illustrations than many 400 page novels. You can read the entire book online and pre-order a copy (I'm pre-ordering two) to be shipped by mid-January. The first run has already sold out. 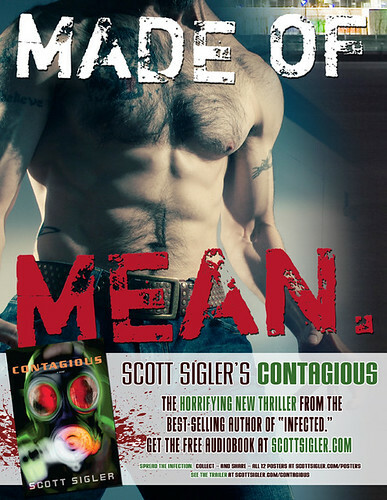 scott sigler's new novel contagious is made of mean!!!! Scott Sigler, the horror science fiction writer who was a great FU of the Week interview back in July, has a new book, Contagious, coming out on December 30th (you can pre-order here) that he asked us to help promote by participating in this very cool poster campaign. Scott has been incredibly smart about using new media to build his audience and foster his career as a writer, and we're glad to be a part. Especially because that's my torso on the poster! Not.